I love coming up with new ideas to decorate my home for Halloween. Usually I spend a lot of time decorating the outside, but this year I’ve been working on DIY inside decorations. I made this fun Letter Art for the ledge between my kitchen and living room using Skittles from Sam’s Club. We don’t have a fireplace with a mantle, so this ledge is where I usually decorate for things I’d usually put on a mantel. It’s where we hang the Christmas stockings, and it’s where I like to decorate for Halloween, too. I had a 2-ft black picture ledge that I had never hung on the wall. 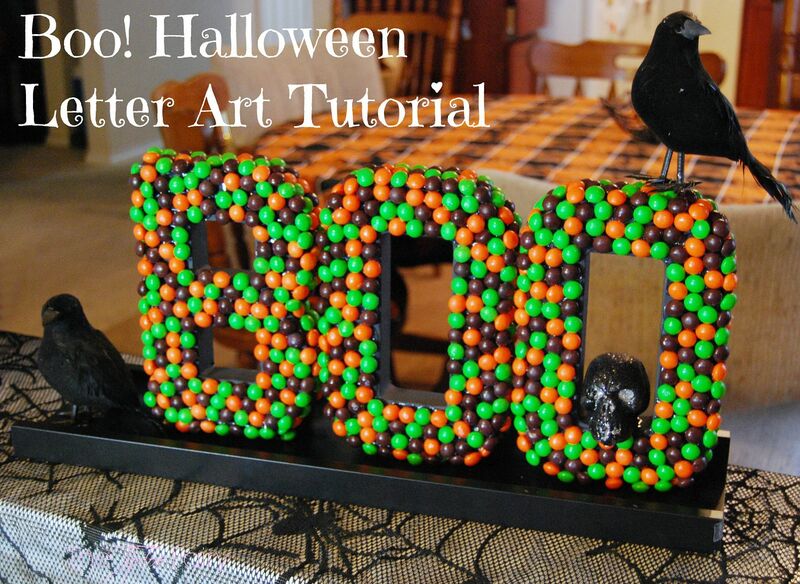 I thought it would work great with the letters so they wouldn’t fall over after I covered them in candy. You’d be surprised how heavy they get when covered in Skittles. Then, I purchased some little decorations from the dollar store – black birds and the glitter skull – to complete the decoration. I just love it! Are you ready to make this fun decoration? Here is an easy picture tutorial. 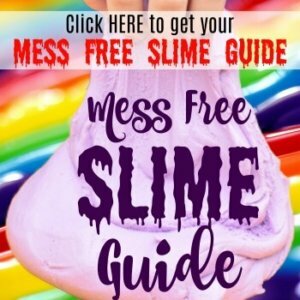 Scroll down and you’ll find the supplies and instructions. Paper Mache letters to spell out BOO. Paint the letters black and allow to dry overnight. Sort the Skittles into green, orange, and purple (Halloween colors!). 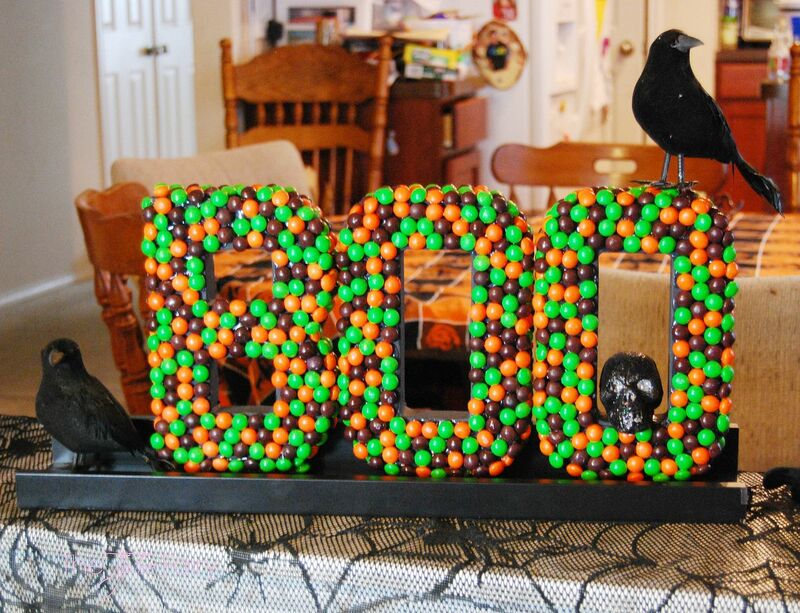 Begin hot gluing the Skittles in random colors all over the letters. After letters are covered, hot glue each letter to the picture ledge on the bottom and at the back. Allow to dry. 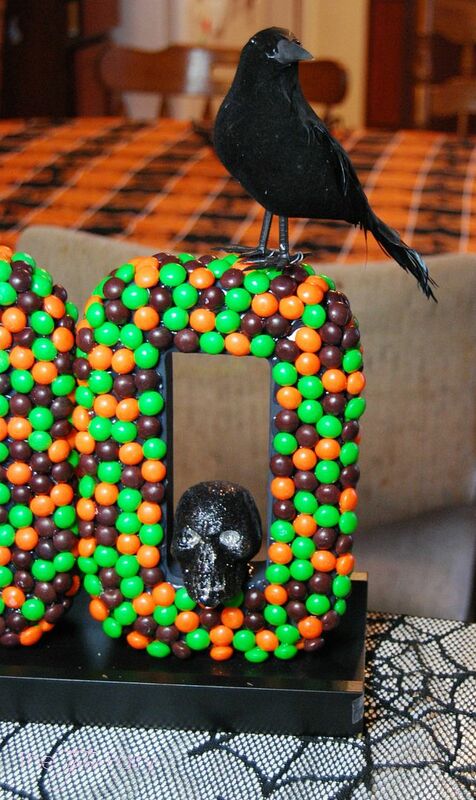 Next, attach fun dollar-store decorations like blackbirds or glitter skulls, pumpkins, etc. Then, add your display to the Halloween decorations on your mantle, nook, or ledge in your house! Let me know if you make this. I can’t wait to see it! What other Halloween decorations do you like to DIY? 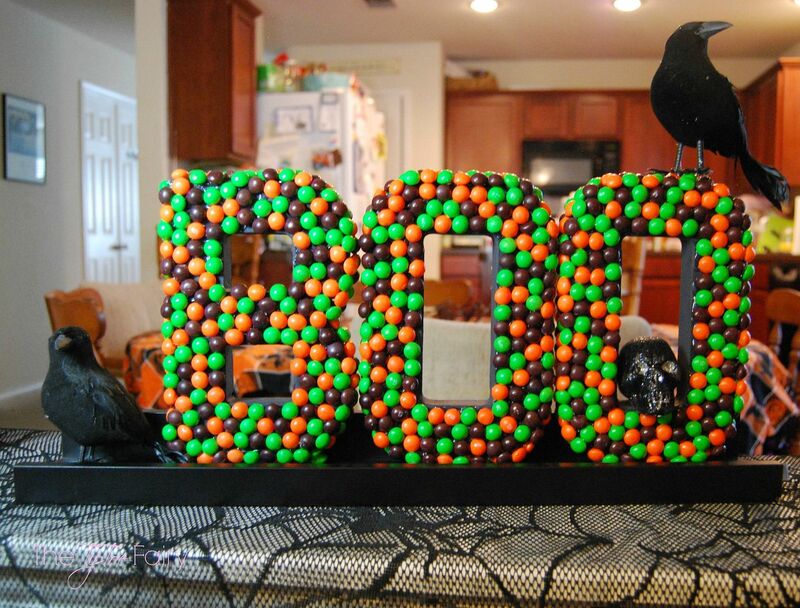 This is so cute.. but not sure I would be able to get the skittles on the letters. Pinning. This is so beyond adorable! LOVE! Did you get your crows from the dollar store or Hobby Lobby? I am going to make this for my daughter’s dorm room, she’ll love it! I don’t have a black shelf but I’ll just paint a piece of wood. How many bags of skittles did it take?? Thanks. Pinning/Stumbling! I used probably 16 regular size bags, but if you get that ginormous bag I bet you could do it from just one bag. Crows came from Dollsr Tree. Letters came from Hobby Lobby. I suggest don’t wait because the letter O is popular lol. I had to go to 3 stores. Oh this is soooooo fun!!!! I think my kids would get a kick out of this!!!! That had to be a lot of work, but it is well worth it, your sign is awesome!!! This is too cute, Stephanie. Stumbling so more people can see it. This is so cute! I would have never thought to cover the letters with candy! Love This!! My boys and I will have to make this. This is super cute! I love the addition of the crows and rat! Hi, is it still edible? LOL I love the idea. It looks great. This is so cute…I absolutely LOVE the colors from the skittles! So creative and fun! The is a fabulous idea for a kid’s craft or party, so clever! This looks like a lot of delicious fun! We always buy our Halloween candy at Sam’s Club! This is so cute and it looks so easy! I’m so behind on the Halloween decorations I have to go search for our decorations this weekend. How cute! I love colorful fall decorations and think it’s very cool that you still decorate like you would IF you had a mantle. The ledge is perfect. I really love it. It’s so colorful. Although I don’t know if I’d get it made before I’d eat all of the skittles.